Knaresborough Town fell to their ninth home defeat of the season on Saturday as Louth Town ran out comfortable 3-0 winners at Manse Lane. After a bright start from Brian Davey’s men, with both Ben Parkes and Colin Heath coming close to opening the scoring, the visitors managed to get a stranglehold on the game thanks to their star striker. Jamie Coulson took his tally to 30 goals for the season with two headed goals on 15 and 39 minutes before Luke Rainer-Mistry sealed the victory nine minutes from time. The defeat means that Knaresborough only boast a better home record than the bottom three sides in the division, having won just three of their 16 games and picking up 13 points. Fans at Manse Lane have also been treated to the fewest goals as Knaresborough have only found the net 14 times at home with Davey again blaming a lack of sharpness. He said: “They were a good strong side but we had one cleared off the line and we hit the post with another before they even got into our half. “We could have been two goals up within minutes but they got their two goals and our chances after that were few and far between. “We just did not look sharp up front again but Brad is only 19 and Mitch is 17 and we’re happy to continue with them until the end of the season because we’re trying to get games under their belts. Davey said he is hopeful that Heath will be available to face struggling Lincoln Moorlands Railway on Saturday after the striker was taken off after 10 minutes against Louth through injury. 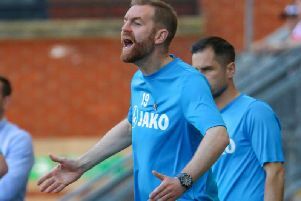 Lincoln are six points from safety in Division One and have not picked up a league win since September, but Davey has warned his side need to be ‘careful’ when they meet. He said: “It’s ideal to be playing Lincoln next but the teams at the bottom are the ones that try there hardest because they’re not the most gifted players. “They have got a new manager and have brought some players in and they’re not getting hammered anymore so we will have to be careful when we come up against them. “If we go in thinking that we are going to score ten then all of a sudden they can get a sneaky goal so we need to go and prepare as normal. “We will be playing Colin or Mitch upfront with Brad and we are quite happy to be swapping the wingers round, trying to get more balls into the box.